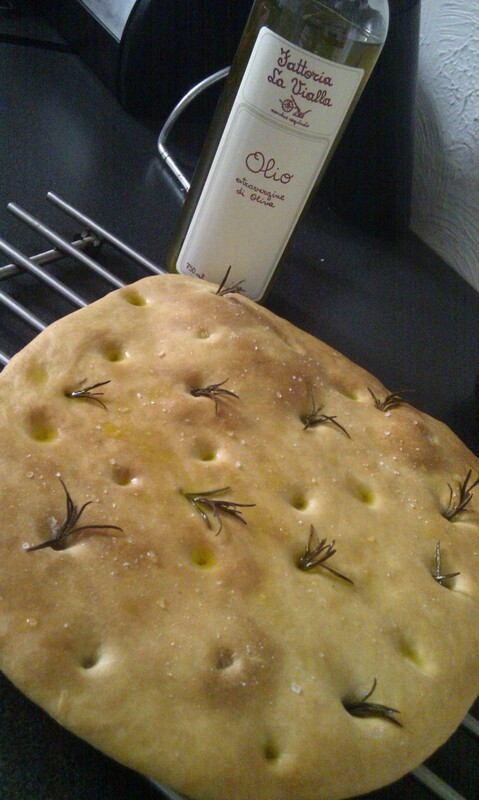 Foccacia – a bread anyone can make, even me! I admit that I am not the best at making bread. My first foray into bread making came when the new issue of Good Food magazine arrived before Christmas 2010. Inside was the recipe to make Panettone – the Christmas sweet cake/bread which is supposed to be light and fluffy like air. Unfortunately I didn’t understand the importance of kneading bread so I think I skipped a kneading and rising time and just hoped for the best. The good thing about it was the taste, it was lovely and tasted just like a Panettone should do, however, the bad thing was that it weighed about as much as I do! It was so dense and heavy that my family still remember my failed attempt and laugh when we get one at Christmas. For a while I was a bit scared to even touch a dough or try making bread of any sort, but this changed when I watched the last series of the Great British Bake off. After getting the cookbook as a present I have made iced fingers, white loaves, bread rolls and bread plaits. Still, every time I still feel completely amazed that it worked. I have never tried to make speciality bread but this time I felt brave, I was going to make a foccacia! Luckily I used a very easy and simple recipe from Lorraine Pascal and it came out perfect. I am sure that it is not a traditional Italian recipe but the end results are so close that you needn’t worry. It is definitely worth having a go, especially since it only needs one set of kneading and looks and tastes very good. I also use my very best olive oil in this recipe, imported from Italy – the taste is just non-comparable. All you need is a bit of Italian sunshine, some salami, bread and a glass of wine. Buon appetito.